Click-On Adaptor plate to remove your cradle and place it out of sight so that it doesn't attract unwanted attention. Ideal accessory for anti-theft purposes. 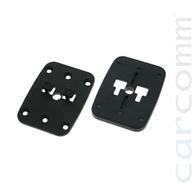 Can be used with for example CSC-01, CSC-02, CSC-06 and car specific Safety-Mounts®.